On the afternoon of November 24th, in the construction site of Jiqing High-speed Railway located in the boundary between Gaomi, Weifang and Jiaozhou, Qingdao, with a long siren of the track laying machine, a pair of 500m long tracks was safely laid onto the ballastless track beds. 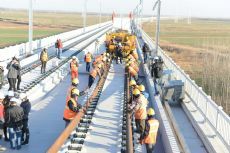 It marks that the Qingdao section of Jiqing High-speed Railway has entered the phase of track lying. With a total length of 307.8km and running through the Shandong Peninsula, the Jiqing High-speed Railway starts in Jinan New East Station and ends in Hongdao Station via the newly-built Jiaodong International Airport and has 11 stations in total. As scheduled, the Jinan-Qingdao High-speed Railway will start commissioning in the first half of next year and open to traffic along all the line at the end of next year. At that time, Jinan-Qingdao Railway will connect the Qingdao-Rongcheng Intercity Railway and Qingdao-Lianyungang Railway etc.